We have our own dining service managed by the centre. 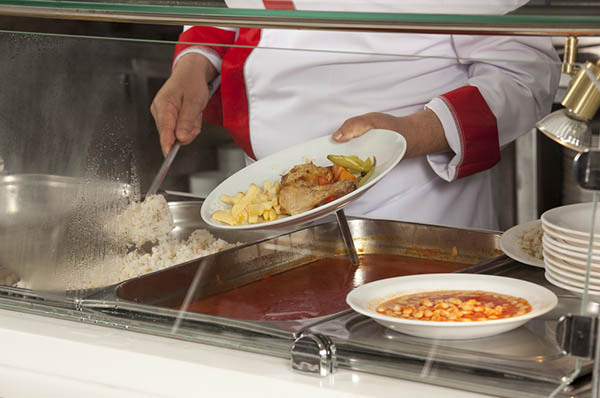 The food is selected and bought by the school itself and is also prepared by our staff. We are aware that the school dining room plays an important educational role. It should serve to encourage a varied and balanced diet as well as to promote gastronomic diversity. School age is a period which not only requires an adequate supply of energy and nutrients to be provided to ensure good nutritional status, but it is also a decisive time to establish healthy eating habits and behaviours that endure over time and are maintained in adulthood. Therefore, our menus are prepared by a nutritionist and from Infant to the 3rd year of Primary the food is served at the tables. From the 4th year of Primary, students use a self-service system and can choose daily between different alternatives. The school can adapt the menu to meet the needs of those students who, for any reason, have specific dietary requirements. Supervision of the dining room is carried out by teachers from the school. The school provides information to families about the school menu as well as about the composition of food regarding allergens.